This powerful portrait shows Douglass as he grew in national prominence during the 1840s. It is particularly interesting in that it is pre-photography portrait, and one of the few (possibly only) known painted portraits that Douglass sat for. Even though Douglass later railed against painted images of African Americans as biased and untruthful, this singular portrait reveals his belief in the necessity for African Americans to visually display their respectability and integrity. 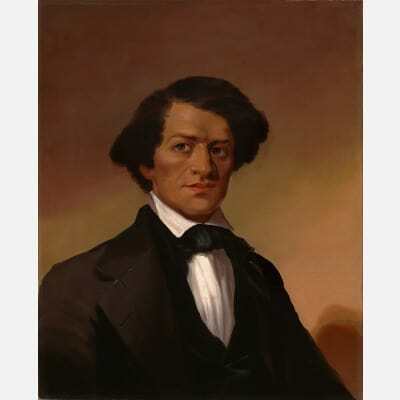 The portrait is very similar to the engraved likeness that appeared as a frontispiece to Douglass’s autobiography, Narrative of the Life of Frederick Douglass, an American Slave (Boston, 1845), and could have been based on the engraving.